Praline is a Southern candy made with brown sugar and pecans. The confection has the unusual property that it melts in your mouth almost instantly after you bite into it. 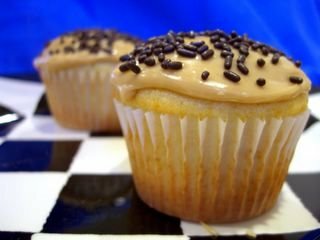 The icing on these cupcakes has the same flavor as praline. I didn’t include any nuts, but the icing really does melt in your mouth. I first used this recipe, which comes from Cooking Light, a few weeks ago to make a layer cake and I enjoyed it so much that I decided to make it again. This time, however, I made cupcakes. The cake is delicious – moist and fluffy, with a lovely taste of vanilla and buttermilk. It is best with frosting and rather plain without it but it would probably be quite tasty with fruits if you are inclined to experiment a bit. It is the icing that really makes this cake work, though. I added a smidge more salt than the original recipe called for, so it is incredibly addictive, with just enough salt to take the edge off the sweetness. It is a wonderful icing and, when paired with the cake, the combination is sure to please anyone eating it. I think it went particularly well with a cup of coffee, which helped to blend the flavors even more and cleanse the palate of excess sugar. I know that I will be using this recipe often in the future. Oh, and try not to eat too much of the icing before you get all your cupcakes frosted. If you have some left over, I highly recommend dipping pretzels or potato chips in it. Divide the batter evenly into the prepared pans, smoothing the surface with a spatula. Bake at 350Â° for 18-22 minutes or until a wooden toothpick inserted in center comes out clean and the top springs back when lightly pressed. did praline frosting this week too! Those look delicious! I love praline! Ooooooh! Looks absolutely delish Nic! Yum! I can’t believe the recipe came from Cooking Light, too! They sound wonderful and look fantastic! I’ll have to remember this recipe next time I need to make a birthday cake. Looks yummy…and somewhat good for you to boot. Hummm, this look so yummy and tasty! Interesting idea of a praline icing! I love anything praline flavor, I don’t see it very often in recipes. My first thought when I saw the picture was a root beer float cupcake, the checkered setting gave me images of old-time soda shops. These look so good, but I always wonder…why do recipes say 12 Tablespoons rather than 3/4 cup? Wouldn’t that be easier to measure? I love the idea of praline icing! Oh my God! Potato chips and frosting! That’s the kind of thing I could lock myself into a dark closet and devour by myself. The cupcakes sounds yummy. Maybe because they’re just small enough that you don’t have the moral dilema of how much to have – they’re the perfect mouthful. Thanks for the recipe, they look delish! I’m going to try them soon. Okay, I tried these yesterday and ran into problems with the icing–it seemed to set as soon as I turned the mixer off! I ended up having to add some milk then mix again to get it even close to a spreading consistency. Did you run into the same problem? No, I didn’t have that problem. Ths icing does set up very quickly, so you just have to work fast! These look great – can’t wait to try them. I have had really bad luck with dessert recipes from CL (love their savory recipes though!) – it’s hard to believe the cake was so tasty. Have you generally liked CL’s desserts, or was this an anomaly? I promise I’m not trying to be annoying, but I just noticed something. On your blog, you have 1 tsp. butter and 2 tsp. vanilla for the frosting. But the original Cooking Light recipe has 2 tsp. butter and 1 tsp. vanilla. Jami – That’s a hard question for me to answer because I try to only make recipes that I think will work and that I will like. When I have made Cooking Light recipes, I have liked them. I recommending reading the reviews on their site to help find ones you will lik. Hi I tried your recipe but my icing got thick too quickly… I also had a hard time frosting. Any ideas? It tasted good overall.. Wanted to know if anyone has adapted this recipe to make pralines? I made the frosting and found that when it set up, it had the consistency of pralines. However, does it need a little tweaking to make a great praline? I’m all for candy recipes that don’t require fooling with a candy thermometer (going by color, grandma’s instruction, etc. )I don’t want to waste 2 cups of pecans though, on a recipe that ain’t that great. I made these and they are absolutly delicious. I did not have any trouble with the frosting and there was plenty of it, to eat and frost. I have found Nicole’s receipes to work perfectly — as long as I follow her instuctions to the letter. The cupcake itself, I think, is very very good by itself. They are good but a little dry, probably due to the buttermilk.